We welcome enquiries from prospective or existing parents and we look forward to hearing from you! Whether you want to meet with us in person using directions we have provided below, email or call us, you can find our details below. Alternatively complete the online form and we will be sure to get back to you promptly. West Street is situated in the centre of Colne adjacent the market hall and directly at the side of the fire and police stations on Craddock Road. Ironically all roads from all direction lead to West Street as we are situated on the towns central one way system around the shopping centre, shops and open market. Traveling along the M65 to the very end you should be faced with the famous Boundary Mill complex on a large roundabout, At this roundabout, take the 1st exit onto Vivary Way/A6068 heading to Keighley/Skipton/A56/Earby/Barnoldswick. At the first set of lights keep in the right hand lane, turning between the BMW and the Mini dealerships. As you travel along this road you need to turn left at the bottom of the road by the strange junction taking you onto north valley road. At the next traffic lights you need to turn right into Lord Street, this is a one way street. Travelling up the hill towards the traffic lights you need to keep in the left hand lane to turn left at the lights taking you onto Albert Road. Travelling up the hill to the very top takes you into the town centre, here you will be filtered into the one way system at Market Street where you will be faced with the Yorkshire bank to your right continue through the town centre passing the open market car park on the right and then the library on the left, from here keep in the right hand lane to the traffic lights which will take you right back around the centre onto Craddock Road/ A56. Travelling round the one way system you should now pass the police and fire stations to your left, immediately to your left you should now see West Street Community Primary School – see the photo above. Just as you pass West Street you will see a turning immediately to the left into Midgley Street this takes you to the school and public car park directly opposite the school gates. Travelling along Colne road/A6068 heading towards Colne and Lancashire Border you should drop down the hill into Laneshawbridge. Keep along this road until you end up at a medium sized roundabout, take the first exit of this onto Keighley Road/ B6250, travel along this road until you come to a set of traffic lights keeping in the left hand lane ready to turn left at these into Craddock Road/ A56. 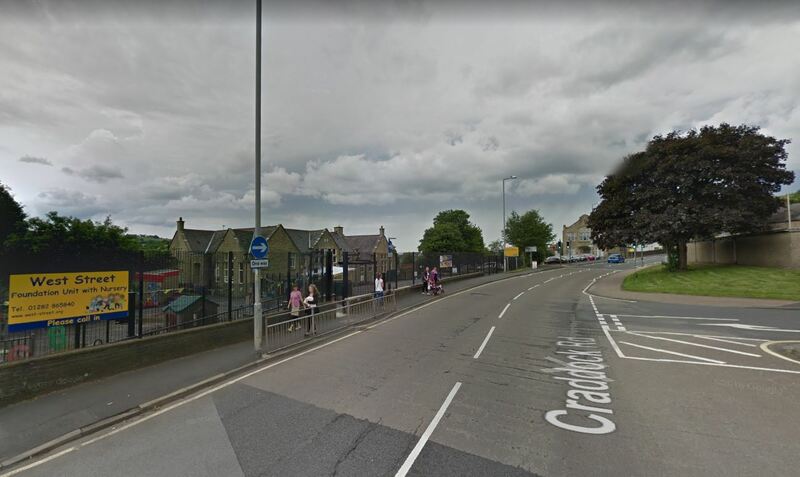 Turning to your left takes you on the one way system around the town centre, you should now pass the police and fire stations to your left, immediately to your left you should now West Street Community Primary School.